In 1920 the League of Nations gave New Zealand control of Western Samoa, formerly a German colony. There was no Samoan involvement in the decision, and the league later refused to hear a petition, signed by 86% of Samoan men, objecting to New Zealand’s administration. New Zealand’s control of Western Samoa, which began in 1914, combined paternalism with incompetence. Samoan customs were belittled and sometimes overridden. Mishandling of the 1918 influenza epidemic resulted in 20% of the local population dying. Passive resistance to New Zealand rule by the O le Mau a Samoa, generally known as the Mau, was responded to with force. In a protest in December 1929 at least eight Mau members were shot and died at the scene – including prominent Samoan leader Tupua Tamasese Lealofi III – and an unknown number died later. 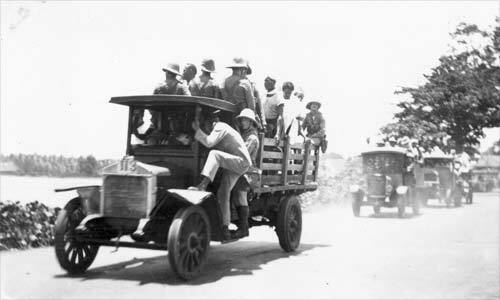 In this photo New Zealand marines are seen transporting Mau prisoners in 1930. Western Samoa became independent in 1962, in part because of United Nations pressure on New Zealand. In 2002 New Zealand Prime Minister Helen Clark formally apologised for ‘the injustices arising from New Zealand’s administration of Samoa in its earlier years’.